Mon cœur captif, que maistresse elle emporte. Loy des humains, bride trop dure et forte. Mon lict desert je couve tant de nuits ? Fait eclipser le Soleil de ma vie. My captive heart, and takes it to be its mistress. Law of mankind, bridle too harsh and strong. Brood on my deserted bed for so many nights? Eclipsed the Sun of my life. Muret, footnoting the Amours, tells us: ‘Vulcan, husband of Venus, was a jealous god. This sonnet has nothing to do with Cassandre, as with several others in this book.’ Vulcan as the husband of Venus, who found her in bed with Mars; are we to assume that Ronsard has been playing with a married lady? Or is this a less-precise reference, which would fit Cassandre better, to another lover competing for her hand and making off with her – perhaps, her husband-to-be rather than a husband? Or is Muret right in saying this has nothing to do with Cassandre – for, after all, we have already encountered many a sonnet addressed to Sinope, Marguerite and other ladies? In the end, does it matter?! Poetry does not, after all, have to be subjected to the analysis which a strict biographer might apply. It is an attractive poem with a novel image in the opening quatrain and some unusual phrases in the second. In both, there are variants in the earlier Blanchemain edition: of these I think we can safely say the older versions of lines 2 and 7 are weaker, but that does not make the version less interesting. Mon cœur captif, que, maistresse, elle emporte. Loy sans raison miserablement forte. Law without reason, wretchedly strong. Quand je fais une oraison ? Deux cents arpens en un tour. D’un son luy raze l’aureille. Et en feroit bonne chere ? Tousjours le vin et l’amour. When I make him a prayer ? Two hundred acres of them. With its call crash on his ear. To bring back golden ingots. Which is served in mountains. And make a great deal from ? Always of wine and love. Blanchemain reprints several footnotes from Richelet’s commentary.In the 4th stanza, he notes that “tous les champs” are ‘the fields of his Vendome region’ (as we’d have guessed from the references to the Braye & Gastine); in the following stanza he tells us that Gobelin was ‘formerly the famous & rich dyer of Paris’, though we now think of his Belgin tapestry factory; and explains that the “rouge venin” (‘red poison’) is scarlet dye in which the wool is soaked for a long time. A stanza later, he epxlains that Prepatour is ‘an excellent wine, whose vine belongs to the king & is in his domain in the Vendome’. The stanzas 3rd & 4th from last also deserve a note or two: Ronsard says “Manger o mon compagnon”, which I guess to be Provençal dialect (“o” for “au”? ), suited to the Avignon/Provencal food mentioned in the following lines, and or the Auvergne form which Gaspar hails. “Pastenade” is also Provençal, and there is even today a special variety of melon (“pompon”) grown around Tours: see here. And what of Gaspar himself? 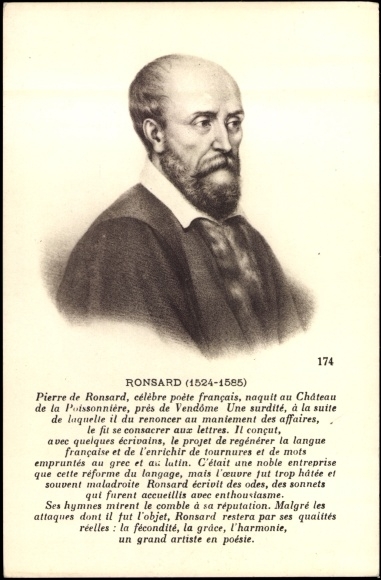 Ronsard’s friend Gaspar (or Gaspard) was another of that learned circle of humanists, known among other things for translating Machiavelli into French – particularly ‘Le Prince’ and “Les discours de l’estat de paix et de guerre”, the former apparently undertaken between 1547 and 1553 but not published till the 1560s, one of three roughly contemporary translations of the notorious work. L’un deshonneur, l’autre dommage apporte. L’un boit mainte eau, l’autre boit mainte larme. Soit l’un ou l’autre, amoureux, ou gendarme. Mars goes alone, Love goes alone. Be one or the other, lover or soldier. A self-explanatory metaphor, attractively worked-out; and no variants in Blanchemain to report. Son regne est de dix ans, gouverné par Mercure. Et l’esprit au sçavoir se veut rendre facond. De flammes et de feux son cœur environné. Desireux de richesse, en force sans pareil. Rendant l’homme guerrier suivant ses estendars. Jusqu’en l’an soixante-huit, âge nommé Vieillesse. L’homme alors vers le ciel tout repentant s’adresse. Soigneux de son salut, des humbles le secours. Foiblesse le conduit, retournant au premier. Moist, delicate, veiled in ignorance. Its reign is ten years long, governed by Mercury. And the spirit tries to become fluent in learning. Their hearts beset by flames and fires. Desiring riches, unequalled in strength. The fifth is Manhood, following the aspect of Mars. Making man a warrior following the standards. Up to the age of 68, the period called Old age. Careful of his salvation, the help of humble men. To his first feebleness, returning to the start. If you are interested, you can look through the plates on the Gallica website. For those who prefer poetry to music, here’s one of Ronsard’s hymns. Apparently the king liked this one so much he learned it by heart and would recite it regularly to his courtiers – or enjoy hearing others recite it! Ce qu’aux autres il commande. Nous pendoit des huit années. Fait tomber dessus la place. Sur les bors de la Charante. Mangent leur chair pour pasture. Quand il se prend à son maistre. De luy-mesmes à la chasse. Nous tenoit les cœurs en serre. Ton nom tes faits et ta gloire. De Mars et de la jeunesse. What he commands others to do. Has hung around our necks. Witnesses to his valiant hand. On the banks of the Charente. To the banks of Acheron. When he takes himself to his master. Off to the hunt by himself. Within the city of Troy. Us all, squeezing our hearts. Rests with you and you alone. Your name, your deeds and your glory. Of Mars and of our youth. Plenty of classical and other learning in here, so let’s add a few notes. Stanzas 3-4 reminds us that this was a period of considerable Catholic-Protestant tension. The Battle of Montcontour was in 1569, during the Third War of Religion, and was (as suggested in stanza 16) decisive. Sadly it did not end the strife; the famous St Bartholomew’s Day massacre took place three years later in 1572 (when Ronsard was in his late 40s). Henry, who was only 18 at the time of the battle, came to the throne in 1574. In stanza 6, the reference to Gordium goes back to Alexander the Great cutting the Gordian knot – a symbol of future rule over Asia and of future victories, hence its appropriate use here. But the knot is also proverbially used as a symbol of insoluble problems; and any claim that Henry III resolved the Wars of Religion at Montcontour can only be considered optimistic…! Pyrrhus (in stanza 14) is another name for Neoptolemus, the rather angry and aggressive son of Achilles who killed old men, boys & women (Priam, Astyanax & Polyxena) in the sack of Troy. I doubt Ronsard is suggesting Henry III is quite so savage or ruthless; the link is rather the decisiveness of the victories. De leur chair font leur pasture. (The Charente ‘acts as their port and guide’; and crows ‘make their feast on their flesh’). Nous avons besoing de bon bruit. Ny aux perles de l’Orient. Pour se monstrer au raiz du jour. De Phoebus au beau crin doré. Jusque à l’esgal des lauriers vers. We have need of good report. Nor to the pearls of the Orient. To show itself in the light of day. Of Phoebus with his fair golden hair. Up to level with the green laurels. Today, a lovely & beautifully-built ode to his friend du Bellay, praising his ‘Olive’ (the first book of sonnets in French). Along the way Ronsard manages to get in a brief but telling patriotic gesture of praise to Henri II’s France, another Rome in the golden age of Augustus. As each stanza moves us one step closer to the goal, in a very carefully-calculated but artful way, there is a definite sense of climax.